I want to start by saying that no one asked me to write this post. I have no reason for writing it other than to share the best cleaning purchase I have ever made. It was seriously a life-changing purchase for me. One Sunday, I was sitting in the church nursery with two friends. They both got talking about steam mops. I mentioned how I had never owned one. I had thought about it, but heard it makes flooring look dull so I just hadn’t bothered. They both told me I needed to try one out. A few days later that week, one of the friends was at my doorstep with her steam mop. I decided to give it a go. I was able to clean all of the floors in my house so quickly! It was amazing. I decided to go ahead and buy one. And then came such a hard decision! I first thought of a Shark Steam Mop. I bought a Shark Rotator Professional Vacuum last January and have been very happy with it (I intend to tell all of you about this, also, but the steam mop is so much more amazing). When I got looking at reviews on Amazon, however, I saw that the Shark mops really had some polarizing reviews. I asked you readers on Facebook and polled my friends, and I found that about half of the people loved their mop and half hated it. I didn’t like those odds, so I looked at other brands. In my searching, I looked at the best seller on Amazon (BISSELL Powerfresh Steam Mop). I always consider Amazon’s best seller. HOWEVER, best seller doesn’t mean best steam mop. I have no idea why all of those mops have been purchased. Was price a factor? Was quality? I also always look at the number one rated. In this case, it happens to still be the BISSELL. I put a lot of stock in reviews, but I also realize that most of the time, people who love something don’t necessarily write a review for it. In my searching, I came across HAAN steam mops. They rate well, but not as well as others. The price is comparable–most of the steam mops were in the same price range as each other. I hadn’t ever heard a HAAN talked about, though. A couple of readers liked theirs. I also had a friend from high school rave over hers. 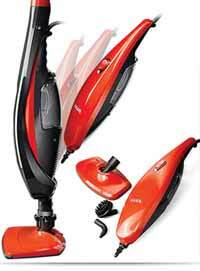 I really felt drawn to it and decided to get the HAAN SI-70 Multi Multiple Purpose Floor Steamer. I love this thing. I can clean my floors so much faster. Each week as I use the steam mop, the floors get a little cleaner than they were the week before. But that is probably safely true of any steam mop out there. This is what sets the HAAN apart. But that isn’t just it. Here is the truly life-changing part for me. It comes with a grout attachment. I cleaned all of the grout in my house in under 30 minutes. Under 30 minutes! And it was amazingly clean. I just used water. I would happily pay this price for just the grout function. In the past, to clean grout was a huge event. I got out the water and baking soda and mixed it into a paste. I put it into the grout and then used a lot of elbow grease to clean the grout. Then I spent a lot of time cleaning the baking soda/water mixture off the floor–it is not a fast wipe-up. It took me hours to do one room. I did my whole house in under 30 minutes! Grout went from a once a year job to easily once a month–weekly if needed (but it isn’t). Earlier this year, I wrote a post on how clean you should keep your house and how I like my house to be clean. I also wrote a post on balancing household responsibilities and I talked about this pull between the need to have a clean home and the need to spend time with children, and how those two needs often seem to interfere with each other. The reason this mop is life changing for me is that I am able to take a couple of cleaning tasks that took a fair amount of time and cut that time WAY down. I don’t lose clean quality (I think doing it consistently just makes it cleaner). I am also doing this amazing cleaning with nothing more than water (I usually do add a Tablespoon of vinegar to the water, though). If I had to return everything I had ever bought that was intended to make cleaning easier save one, I would keep this mop. That is how much I like it. I highly, highly recommend it. Oh- a side note, something nice about this mop is the cord length. The mop I tried of my friend’s was had such a short cord I couldn’t plug it in one spot and do my entire kitchen. With this one, I can. So if you have a large area to clean, be sure to consider cord length. Another thing to note, this comes with two pads. It is definitely enough. I bought the extra pack of 4 pads. At first, I thought it was overkill. But I have found I like to use one pad for the bathrooms and one for the kitchen. So two is sufficient, but I have used 4 so far. A 2-pack would be perfect, though I don’t think it will hurt to have a couple of new pads waiting to be used in the future. Another thing I like about this mop is that it doesn’t leave my floors wet. Some steam mops leave so much water on the floor that you have to use a towel to dry it when you are done. Thanks so much for this Valerie! I have a shark steam mop. I paid like $100 for it and it didn't last. I was so disappointed, and I was never blown away by it to begin with. It was just adequate. This one sounds great! I would love to have another one. I will definitely wait for an update on how it lasts for you before I buy. My shark made it to about 10 months before it quit making steam. The grout cleaner on this one sounds great too! I HATE how long it takes to do the grout! I hope you're back with good news in a couple months! Wow! Hearing you so excited about a cleaning product like this grabs my attention! I am always looking for great purchases like this. I currently like my steam mop, but it certainly doesn't clean grout nor does it come apart. I will keep this one in mind next time I'm in the market. Have you used it on hardwood flooring? I'm waiting for your 3 month update too 🙂 Part of my house is big stone tiles with large grout spaces. The grout seems kind of rough and I'm worried aobut the fabric of the pads catching on them. What do you think? Ross and Taya–my wood floors are laminate. My friend has hardwood and uses her steam mop on her floors. Hers is the one that leaves a lot of water, so she has to wipe it up with a dry towel when she is done. Barnold Barnes, I don't know. I have some wide grout in my house (which drives me crazy. Terrible idea. Though I guess it is easier for the installer to to wide lines). I don't have snagging issues. Do you have a microfiber clothe you could run over it to see what happens? Thanks for the review. I am looking for something that will do a good a job as my cleaning services. I hope that a steam mop can do the trick. I just ordered this! Really hoping it works well. I am so sick of mopping! I was tempted to go with the Bissell b/c of the two year warranty and what you said about this one breaking after three months. Hopefully it works out for you! Mine is still great and it has been over 3 months now. We use it every week.